Tonight on AMC THE WALKING DEAD returns with a whole new episode. On tonight’s show called, “Clear” which is suppose to be one of the most special and influential episodes of the season, Rick has found his lost friend and is forced to make a decision that could change his life. Andrea grows suspicious of the Governor’s plans. Did you watch last week’s episode? 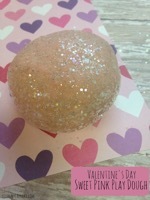 We did and we recapped it here for you! On last week’s show Andrea grew uneasy with the governor. Andrea told the Governor that she was going to see her friends and the Governor told her if she goes, she stays there. We knew he did not mean it. Andrea didnot listen to the Governor and she went to Milton for help to get out so she cold go to the prison. Unbeknownst to Andrea, Milton went behind her back and told the Governor. Andrea got to the prison and tried to convince Rick and the gang to go to Woodbury. She warned them Philip was going to come after them and he had a town behind him. On tonight’s show Rick meets up with an old friend of his Morgan. 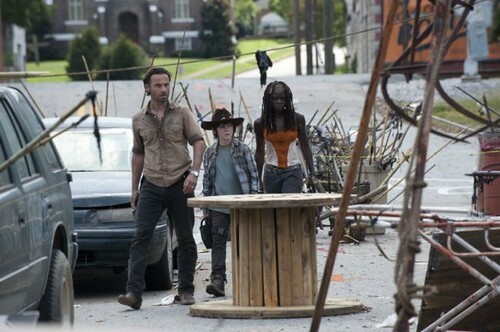 Michonne, Rick and Carl go for a drive and come to the town where Rick use to be sheriff. Carl is not pleased that Michonne is with them and complains. Tonight’s The Walking Dead Season 3 episode 12 is going to be exciting, and you won’t want to miss it. So be sure to tune in for our live coverage of the new episode of The Walking Dead — tonight at 9PM EST! While you wait for our recap, hit the comments and let us know how know what you thought of TWD’s season 3 episode 11 last week. Check out a sneak peek of The Walking Dead “Clear” below which they released today! Don’t forget to come back at 9PM. RECAP: Rick, Michonne and Carl are in the car, they pass a guy with a backpack who screams for them to stop and they just keep going. 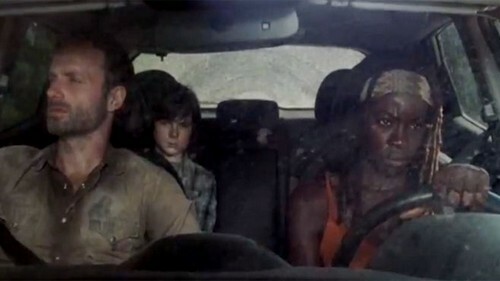 Next, they pass a scene of wreckage and Michonne is driving, she gets their car stuck in mud, then all of a sudden walkers are upon them, tons of them. They end up taking out the walkers, then pillaging all the cars for their loot. Carl questions Rick on why he took Michonne with them, how can he trust him. All of a sudden, the guy with the backpack is running towards them on the road, Rick tells Carl to get in the car, they are leaving. The trio is now in town and there are green arrows on the ground that they are following, but Rick is cautious and Michonne is ready to fire at a moments notice. The town appears to have had at one time a barricade out front. Rick wants them to get in and get the hell out fast before they have trouble. A lone walker shows up and all of sudden someone from a roof top shoots it and tells them to put down their weapons. The trio make a run for it and bullets start flying like crazy. Michonne runs to the roof top to find it empty, the guy is now on the ground and he is still shooting at Rick, when Carl comes out of no where and shoots the guy. Rick asks Carl if he is ok, please, like he hasn’t shot someone before. Rick pulls off the guys mask, he knows him and cares if he lives or die. The good thing is, the guy had on body armor. There are booby traps all over the town, Rick warns everyone to be careful. They drag the guy up to his apartment and find that it is filled with ammo. Rick finds a walkie talkie, then he goes over to a chalk board and starts reading what is written there. Rick wants to wait for the guy to wake up, Michonne doesn’t because based on all the ammo, she thinks the guy is crazy. Carl heads over to the board as well and sees the neighborhood that is all mapped out. Michonne starts eating something and Rick can’t believe she is eating the guys’ food. Carl wants to go for a run on his own, go check some cribs to see if he can get supplies for his little sister. Rick is at first against it, but Michonne volunteers to go with him, so Rick says yes. Outside, Carl tells Michonne that she doesn’t have to go with him, he can handle it. While Michonne is killing a walker, Carl takes off on her. It doesn’t take long for Michonne to find him, he tells her that he wants to do this on his own. Rick starts to talking to the guy, who is now starting to wake up, but his hands are secure. Rick tells him that he is sorry what happened to him. All of a sudden, the guy gets up, his hands are loose, his name is Morgan. Rick and Morgan get into a fight, Morgan stabs Rick in the shoulder, Rick goes to shoot him and Morgan begs to be shot. Rick tries to help Morgan to recall how they know each other. Morgan tells him that he was on the road for days with his boy and he tried to contact Rick on the walkie talkie he left for him but there was no answer. Rick goes on to say how he found his wife and son, Morgan asks if they turned, Rick says no, his wife died. Morgan tells how his wife turned and he didn’t shoot her because he couldn’t. His wife walker bit his son Dwayne, everything was red, then Morgan shot her finally, but it was too late. Morgan asks Rick if his son is dead and when he says no, he tells him that he will be. Carl and Michonne are at a building that reads, King County, it is full of walkers. All of a sudden, Carl tells off Michonne and tells her that he is going to go in that building and he knows how he can, and she can’t stop him. Michonne agrees that she can’t stop him, but he also can’t stop her from helping him. The two head into a building, but first throw some rodents inside small cages for bait. A walker grabs Carl’s foot and Michonne puts her blade in his head. All of a sudden, the two are taken over by walkers, they are coming out of everywhere. Michonne and Carl escape, she tells him to wait there and she will get it done. Carl waits outside the door and Michonne returns with the photo that he wanted, it is of his mom and dad and him. Carl wanted the photo for his little sister, to show his little sister. Rick tells Morgan about the prison, he tells him he is convinced that they were supposed to find him. Rick wants the guns, Morgan wants to know why. Rick tries to reason with him and tells him that he has to come back from this. Morgan is more disturbed than Rick, if that is possible! Rick is outside, he meets up with Carl and Michonne who have a crib and other supplies. Morgan is fixing his barricade when Carl apologizes for shooting him. Morgan tells him to never be sorry. Rick is packing the car and Carl tells him that Michonne is ok, she is one of them. Wow, is that all it is going to take for Rick to welcome Michonne with open arms? Michonne then tells Rick that she knows he see things and it’s ok, she used to see her dead boyfriend. Rick then asks her to drive, they leave Morgan behind. They pass the backpack that the guy was holding on their way in to town, they stop and pick it up.